Alexis is originally from Tulsa OK. She has been a nurse for 10 years, working primarily in Surgery. Before moving to Shawnee, she worked in pediatric cardiovascular and thoracic surgery in Austin, TX. She has degrees from Tulsa Community College (RN) and Rogers State University (BSN) and is ACLS certified. Alexis enjoys listening to her Regina Spector playlists, discovering exciting dining experiences, and spending her free time laughing and savoring close friendships. She is currently working through the books on the *Our Shared Shelf *reading list. She lives in Shawnee with her two children and Tom, her husband of 17 years, who is an Episcopal Priest. 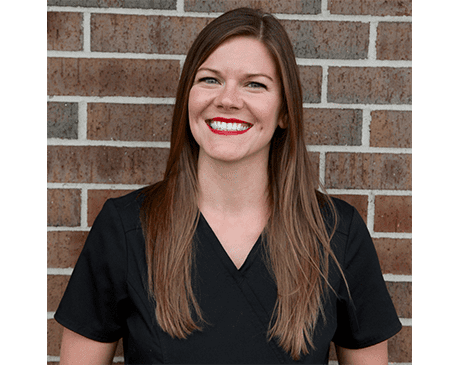 Alexis is excited to have a break from many long hours of call and surgery and looks forward to embarking on this new journey of helping others through daily work in aesthetic services.